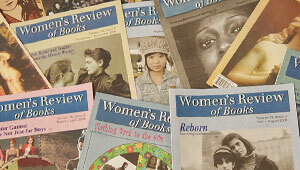 Women's Review of Books, the forum for serious, informed discussion of new writing by and about women, published by the Wellesley Centers for Women (WCW) in collaboration with Old City Publishing, is celebrating its 30th anniversary in 2013. Hoffman notes that even after 40 years of the contemporary women’s movement, feminist scholarship and critical analysis, and women’s creative writing receive little more attention in the mainstream media in 2013 than they had in 1983. While university, small, and trade publishers are releasing an outpouring of interesting, challenging, original books by women, most of these are overlooked by daily newspapers, glossy magazines, and book review publications. Women’s Review of Books has been published by the Wellesley Centers for Women since 1983. Based at Wellesley College, WCW is one of the largest gender-focused research-and-action organizations in the world. Scholars at the Centers conduct social science research and evaluation, develop theory and publications, and implement action programs on issues that put women’s lives and women’s concerns at the center. Since 1974, work at the Centers has generated changes in attitudes, practices, and public policy.